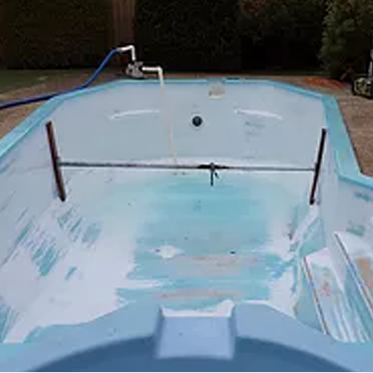 A common problem we come across is seeing fading around the inner gel coat that produces dark lines showing on the most visible part of the pool surface. This is not normal and should be checked by a pool installer like Perth Fibre Glass Pools. These problems can also be known as spider cracks. We have some good and bad news about gel coat spider cracks. The bad news: it’s hard to spot them before its a problem even in an empty pool they don’t show up very well. The good news: it’s hard to see them, so in the unlikely event that they develop in your pool, guests won’t know they are there. Spider cracks are hairline cracks that occur in the surface layer, or gel coat, of a fiberglass product. 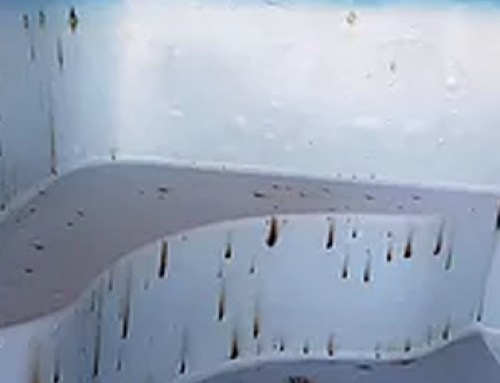 They are not structural in nature—the crack is normally only through the thin layer of gel coat and does not typically extend into the structural laminate layers of the pool. They are typically isolated to one small area of the pool and not a phenomenon that affects large areas. They call them spider cracks because of the way they resemble a spider web. What causes gel coat cracks? Gel coat spider cracks in fiberglass pools are a result of pressure on a given point of the pool shell that exceeds the gel coat’s ability to flex. This pressure could be a result of improper shipping, improper manufacturing, or improper installation. We sometimes have to work on pools by other manufacturers that were simply built too thin and couldn’t withstand the pressures of lifting and shipping. They arrived on the job site with gel coat cracks, and unfortunately, we had to send them back. We’ve received pools that were built correctly but not stabilized properly during shipping with the same result. But installation is when the most common human error leads to gel coat cracks. All care should be taken when installing a pool base. Sometimes a protrusion on the pool floor like a tree root or clump of dirt (neither should be there) exerts enough pressure to cause a spider crack in the gel coat. This occurs occasionally, but the most common cause of pressure on the floor of a fiberglass pool comes from the installer’s attempts to level the pool shell. Many times, fiberglass pool installers are forced to attempt to level a pool shell that is 2–3″ out of level despite their best efforts to modify the base that the pool rests on. They lift and tweak the pool shell until they get it within a tolerable range. 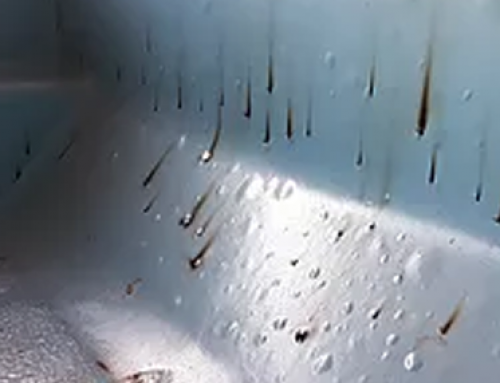 This exerts a tremendous amount of pressure on the pool that sometimes results in gel coat cracks that can happen immediately or eventually develop over time. It’s also true that some manufacturers simply don’t build level pool shells. This leads to these extreme efforts by the installer to make an unlevel pool level.